Discussion in 'Off-Topic' started by Amra, Aug 29, 2006. NASA announced Tuesday that its new Crew Exploration Vehicle will be named Orion. Orion is the vehicle NASA's Constellation Program is developing to carry a new generation of explorers back to the moon and later to Mars. Orion will succeed the space shuttle as NASA's primary vehicle for human space exploration. Orion's first flight with astronauts onboard is planned for no later than 2014 to the International Space Station. Its first flight to the moon is planned for no later than 2020. Orion is named for one of the brightest, most familiar and easily identifiable constellations. "Many of its stars have been used for navigation and guided explorers to new worlds for centuries," said Orion Project Manager Skip Hatfield. "Our team, and all of NASA - and, I believe, our country - grows more excited with every step forward this program takes. The future for space exploration is coming quickly." In June, NASA announced the launch vehicles under development by the Constellation Program have been named Ares, a synonym for Mars. The booster that will launch Orion will be called Ares I, and a larger heavy-lift launch vehicle will be known as Ares V.
Orion will be capable of transporting cargo and up to six crew members to and from the International Space Station. It can carry four crewmembers for lunar missions. Later, it can support crew transfers for Mars missions. Orion borrows its shape from space capsules of the past, but takes advantage of the latest technology in computers, electronics, life support, propulsion and heat protection systems. The capsule's conical shape is the safest and most reliable for re-entering the Earth's atmosphere, especially at the velocities required for a direct return form the moon. Orion will be 16.5 feet in diameter and have a mass of about 25 tons. Inside, it will have more than 2.5 times the volume of an Apollo capsule. The spacecraft will return humans to the moon to stay for long periods as a testing ground for the longer journey to Mars. NASA's Johnson Space Center, Houston, manages the Constellation Program and the agency's Marshall Space Flight Center, Huntsville, Ala., manages the Exploration Launch Projects' office for the Exploration Systems Mission Directorate, Washington. Whatever happened to the X-33 (the vehicle you see detaching from the ISS in the opening credits of Enterprise)? I know the project (and others) was cancelled, but surely not scrapped altogether? Orion as the name for a landing capsule is a bit off. Perfect for a Space Shuttle name, but not for a lander. Actually, both names raise some questions. Orion was a hunter, Ares was the Greek god of War. Is this project really about exploration or is it about the militarisation of space? Look at it this way: Ares launch vehicle or Ares class 'Battleship'? Orion Lunar Lander or Orion class fighter? Both X-33 and X-34 were cancelled. X-33 never really had much working hardware so there was not much to scrap. Single stage to orbit just isn't a reality now. So yeah, it's dead. X-34 just lacked an engine. Pretty much the rest of the vehicles was ready to go. It even did some captive carry testing as seen here. 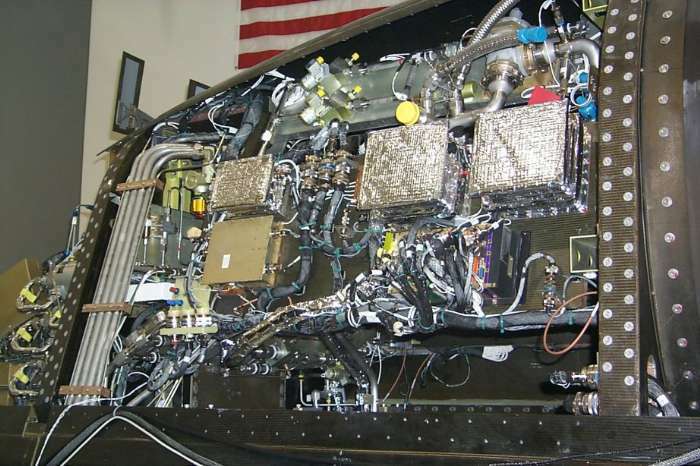 The avionics and hydraulics were complete. The airframes are still in storage and maybe one day they will fly. It's more than just a lander. It's a transport. I think you are pondering this too much. Later, it can support crew transfers for Mars missions. Mars missions make me think of this. NASA is really in the doldrums right now, I hope this will give them a spark but I'm not holding my breath. People really just aren't interested in space anymore. We wanted to get to the moon to beat the russians. Now we have this touchy feely international space station where everyone plays nice. We need a rival, we need someone to beat. No one will innovate beyond the bare minimum if there is no reason to do so. NASA Administrator Michael Griffin at least now has the law behind him. After a lengthy national discourse, the bold challenge of the President's Vision for Space Exploration was endorsed by the Congress in the NASA Authorization Act of 2005. I firmly believe that the Vision is the proper lasting legacy for the astronauts who perished in the Columbia accident. It sets a course in space for our generation and, indeed, future generations. The law charges the NASA Administrator to "establish a program to develop a sustained human presence on the Moon, including a robust precursor program, to promote exploration, science, commerce, and United States preeminence in space, as a stepping-stone to future exploration of Mars and other destinations." That is true on so many levels. If you think I'm speaking out of my arse, try this as a start. There are quite a few links at the bottom covering things like arguments for a US Space Force and the development of weapons platforms and space-based bombers and fighter type craft. There are also a couple of links about a US Space Force. One of the links I found most interesting was the scrapping of the 'Blackstar'. A two-stage-to-orbit vehicle based on the earlier XB-70. They must have realised they had the design wrong after they were beaten to it by SpaceShipOne. which has at least some design features in common with earlier USAF designs. Also, iirc, the Air Force 2020 report includes things like this. Well you can't deny that the USG has been trying to achieve a 2 stage orbiter for decades... and SpaceShipOne got there first. In the absence of a military threat commercial competition seems the best way to go. Remember also that we have scramjets now, something SpaceShipOne didn't have, so that will make things even cheaper... don't expect to see them in operation for a while yet. I saw a report about six months ago that Russia wants to mine helium isotopes on the moon. That's just one thing to be mined out there, a civilian mining facility in space would be lucrative to say the least. Helium isotopes? What the hell for? On a related topic, what does everyone think about private space exploration or space tourism or whatever? ??? What is your issue with him? Just a hint, you will have to get a job before you can afford such a trip. This job thing going to happen anytime soon? Richard Branson? He's a complete sleazebag. Is there any point to this comment apart from being a cheap shot? You're right, I should abandon my PhD and go get a job at McDonald's quick snap. It's not a cheap shot. You have said before, many times, that you don't have a job. Perhaps I've missed it but I don't see where you are going. Buggered if I know. I'll see if I can dig up the link later. @Amra: What part of doing a PhD don't you understand? Is it the concept of getting qualified before working that escapes you? Why would I say anyone is a sleazebag? It's my personal appraisal of him. Not to mention his policy on hostesses on his airlines. But I fail to see what that has to do with anything. I was making a wry comment about sleazy commercialisation of what was once the noble field of space exploration (one small step and all that). I'm not actually planning on buying one of those half a million dollar tickets or whatever they are going to be. Not to mention his policy on hostesses on his airlines. Again, you fail to share any real info. I'm not actually planning on buying one of those half a million dollar tickets or whatever they are going to be. If you are waiting that means you are planning to go. At least that is how I took it. I guess you are going to blow that off now. What was so "noble" about space exploration? The Government will never field a truly successful venture into space. It will be Companies that want to profit from space that will take us into space.